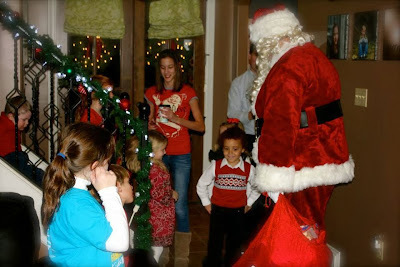 Sometime in October, I got my heart set on having a Milk and Cookies with Santa party. However, my house cannot accommodate any gathering larger than the 4 people who live in it. So I did what I do best and I talked someone else into coming along on this crazy ride with me. Enter Annie. Hi Annie! I called Annie up and pitched the idea of an easy and stress free party. I'd ask Chris's friend Mike to play Santa. We'd have guests bring cookies so the food is taken care of. All we'd need to do as hosts is provide some milk, cups, and paper plates. And all she'd need to do is have it at her already decorated for Christmas anyway house. Perfect idea right! Except nothing Annie and I do is easy and stress free. 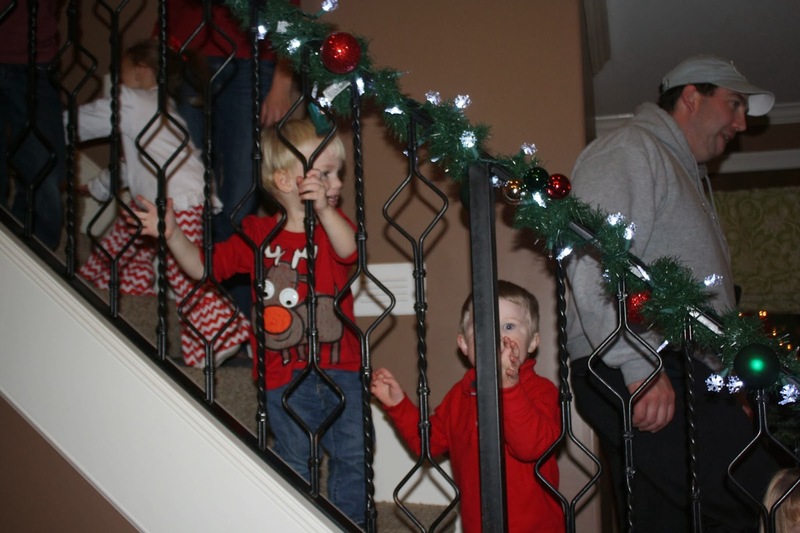 So she went all out getting a fresh coat of paint on the walls, flower beds mulched, deep cleaned the house, made 6 brand new and gorgeous stockings to hang on her mantle, oh and because my day was super crazy on Friday she took care of making all the hot chocolate while setting up for the party. I was up until midnight Thursday night decorating milk boxes for the kids, and baking cake balls. Easy and stress free, right! Ha! Still, I think I some how came out with the easier part of the to do list. Hopefully Annie hasn't figured that out or else she may not be willing to ever do this with me again. So for our first day of Christmas, we hosted a Milk and Cookies with Santa Social. This was actually a pretty early picture. 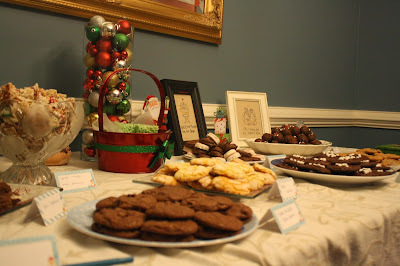 By the time everyone arrived it was packed with cookies and they were all very yummy. 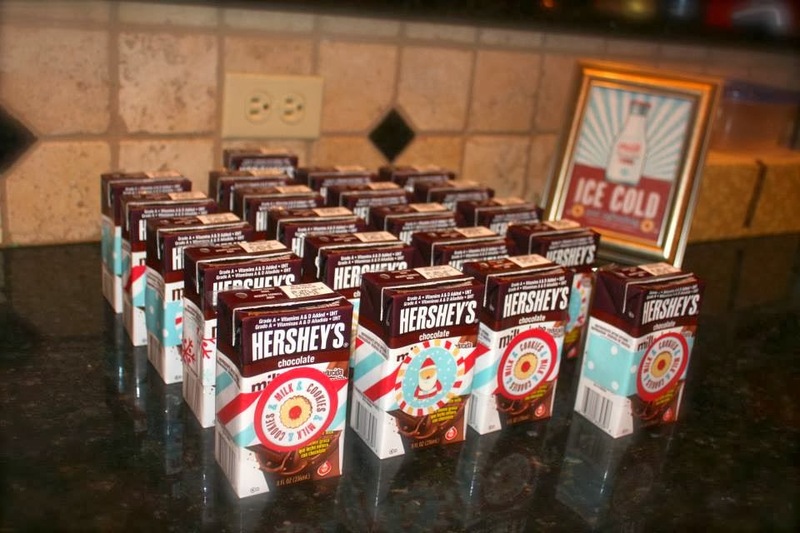 We also had a hot chocolate bar for the adults. With toppings like snowman poop and crushed sugar plum dreams, I let Chris name the toppings. Annie told me the head count was 48 people. We had 48 people there, but I think each little kid should be counted twice since we pumped them full of sugar and they were moving at break neck pace so it really felt like more people. 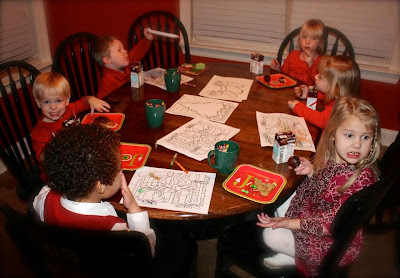 Cody, Collin, Sarah, Abby, Jessie, and Jack enjoying some cookies and chocolate milk while coloring. Everyone had a wonderful time sampling the various cookies, and drinking some delicious hot chocolate while mixing and mingling and having a good time. 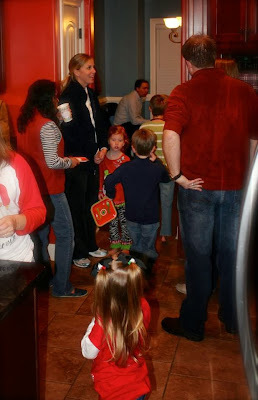 Chatting in the kitchen while kids funnel back and forth from various sugar sources. I actually am sharing the above picture to brag about my husband. See Chris's back on the right side of the picture. How his shirt is different shades of red. Yeah, that's because he's soaked. It was pouring rain, ice cold nasty rain. And I did not know that rain was in the forecast. 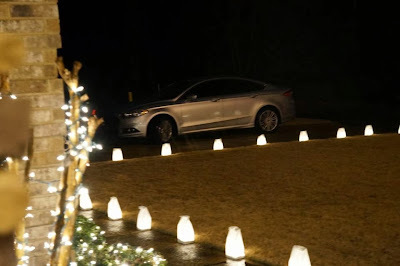 So I had been up late working on making snowflake luminaries to line the drive and walk ways. I love luminaries. There is something so beautiful about them especially when a whole neighborhood or street gets together and puts them up. But you see a lit candle in the rain really isn't going to work. So my dear husband before the party stood out in the garage and folded them all over, cut vent holes in the back and then lit them and put them out in the rain for me. That's a good man. Then after everyone was good and full of cookies it was time for the big man to make his entrance. 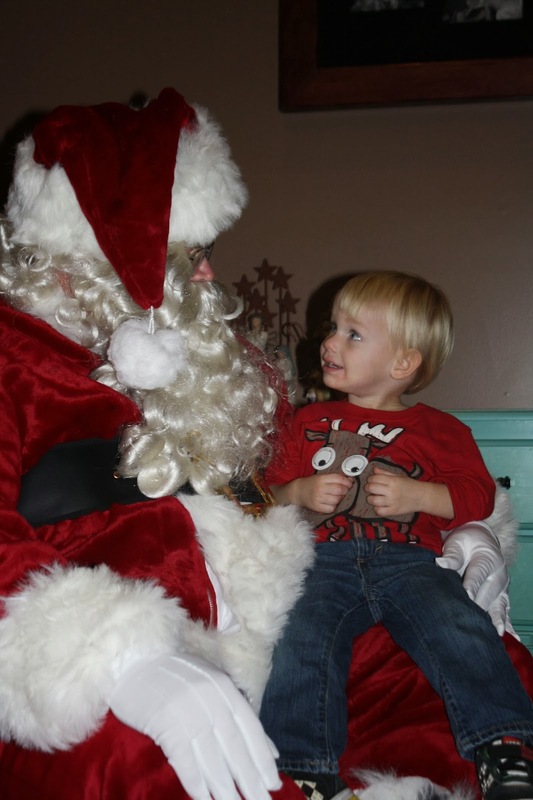 Cody was very excited to see Santa. 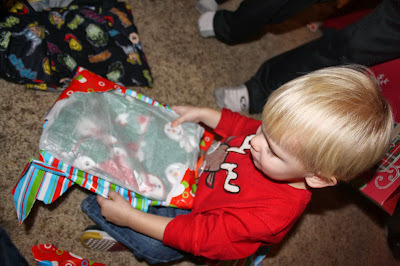 No tears this year just a look of wonder and joy. 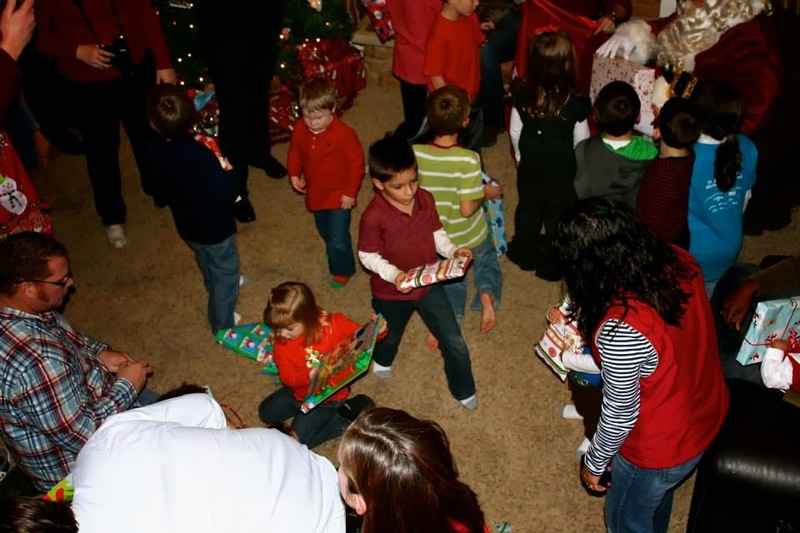 It was a bit chaotic when Santa arrived. But we quickly got the kids organized in a line so they could each have a turn sitting on his lap and talking to him. 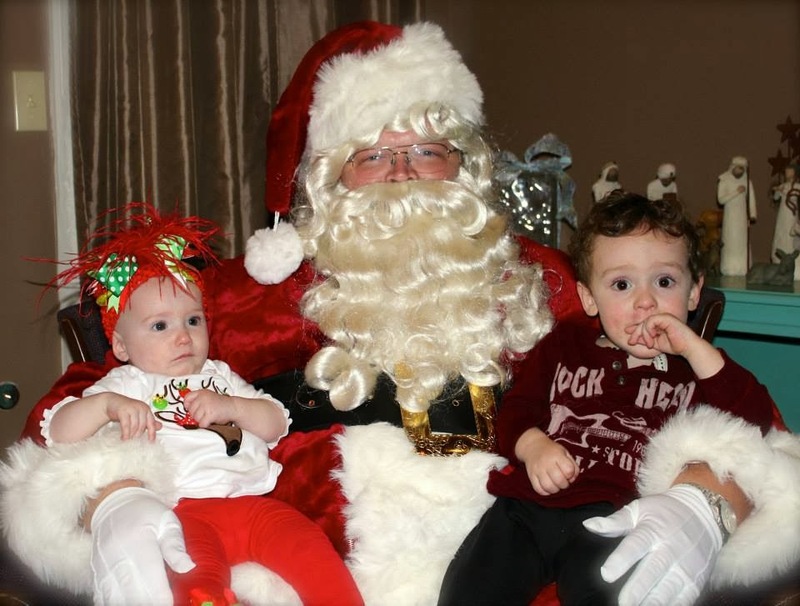 Tom did a great job getting a picture of each kid with Santa. So it was nice not to really have to worry but I did snap a few of my own kids on his lap. Sarah told Santa about the singing Ariel doll she wants for Christmas. She described it in extreme detail because I told her last time we were at Wal-mart that Santa didn't know what she was talking about and need her to take a picture and send it to him. (I'm an awesome mom). So I guess since this was her big chance to explain it she made sure he understood what she wanted. 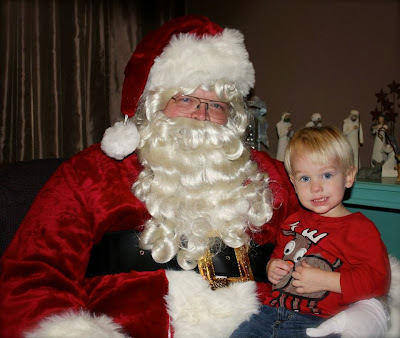 Cody was excited and ready when it was his turn to sit on Santa's lap. 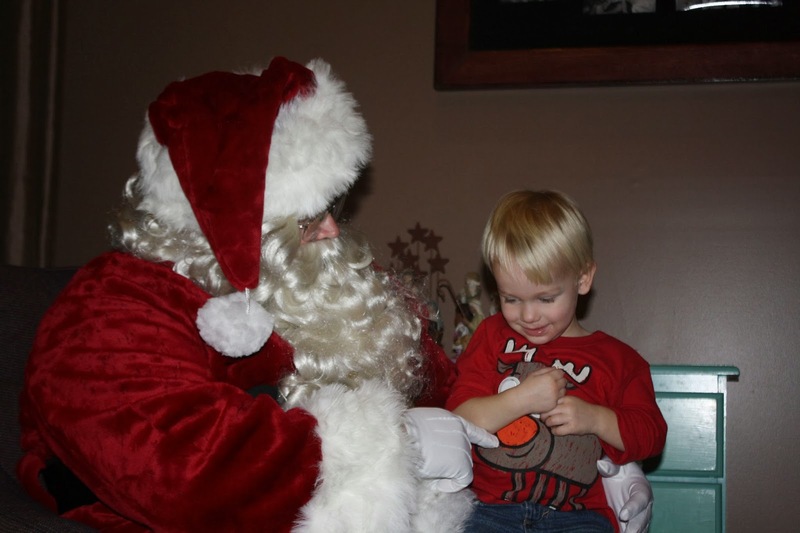 Santa pointed out that Cody had a reindeer on his shirt. And I couldn't hear what they talked about. But hopefully he asked for the airplane movie cause that's what he's been telling us. Emily and her family were also able to make it to the party. 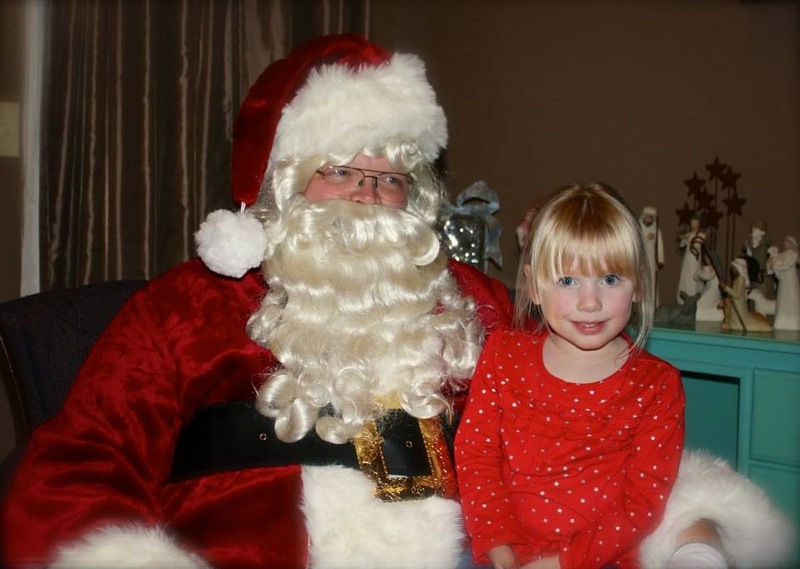 Her kids are very calm so Henry had no problems with Santa and it took Allison just long enough for us to take a picture before she realized her mom wasn't holding us. 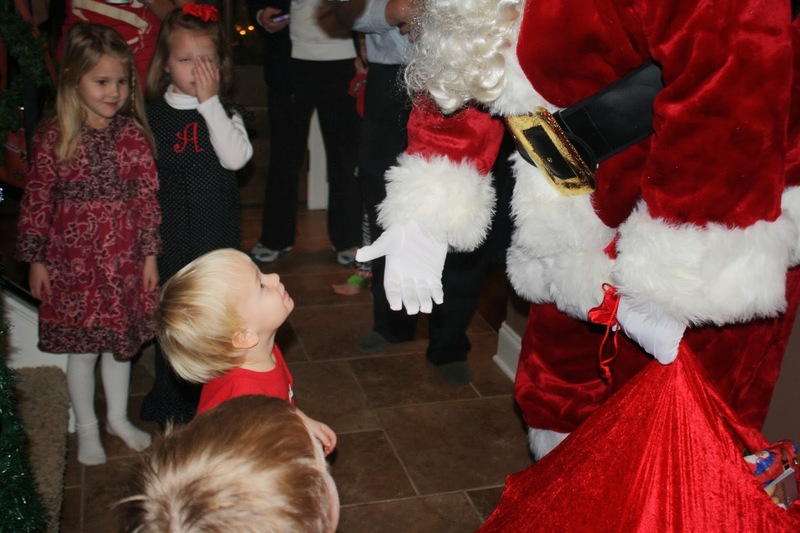 After all the kids got some one on one time with the Big Man. 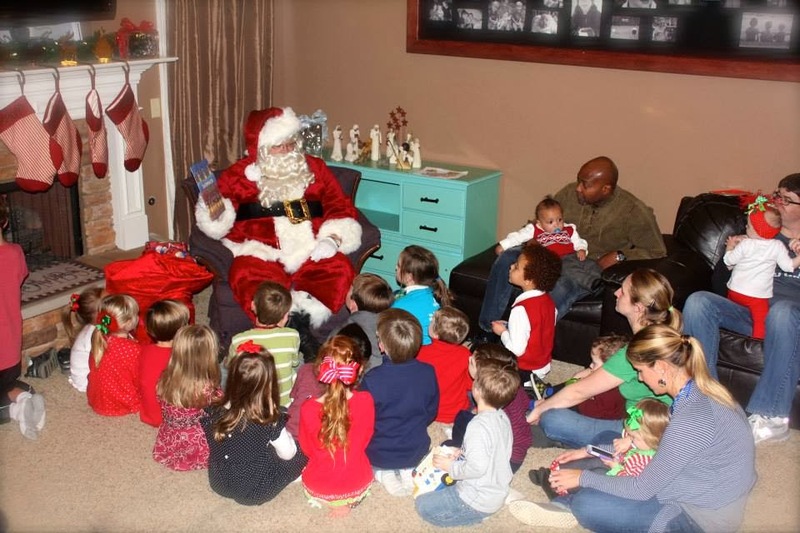 He gathered them all together to read them a story. Santa did a great job and all the kids were captivated by him. 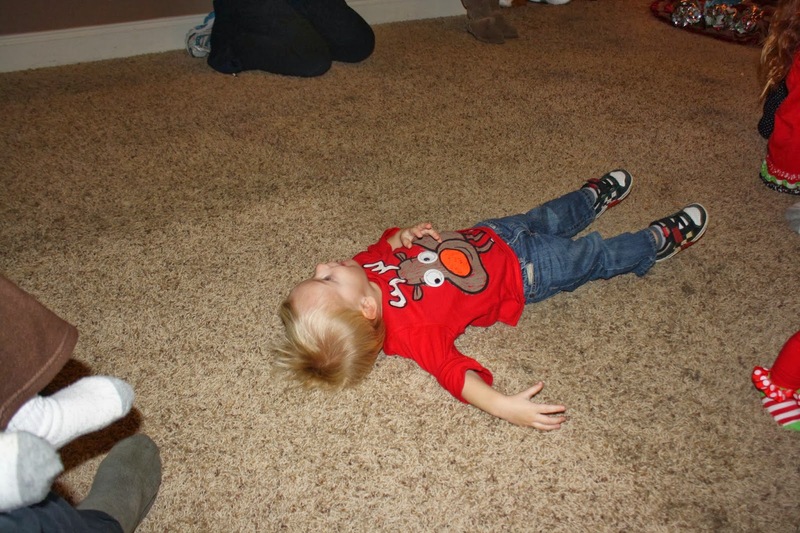 Then he passed out presents to all the kids. Annie and I asked the parents to bring wrapped pjs for their kids for Santa to pass out. I know we have a tradition of them getting new jammies for Christmas and we give them to them on Christmas eve but I thought why not have Santa bring them early so they could wear them already. He was going to tell the kids about the Christmas magic he put in them so they'd sleep better Christmas eve but once the presents started coming out pure chaos erupted. Oh well. 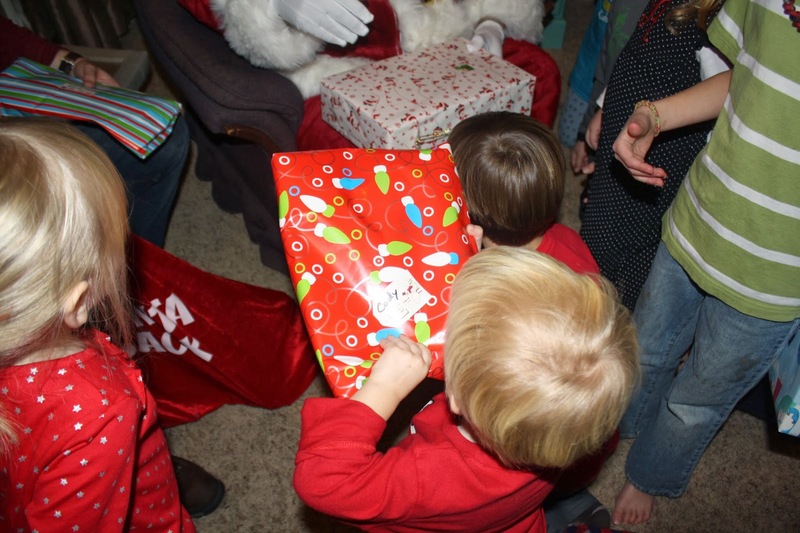 It was cute and the kids were all excited. Cody getting his present. Sorry for the bad angle, he was right under me and I had to snap quick. Because he dropped straight to floor and started tearing into it. 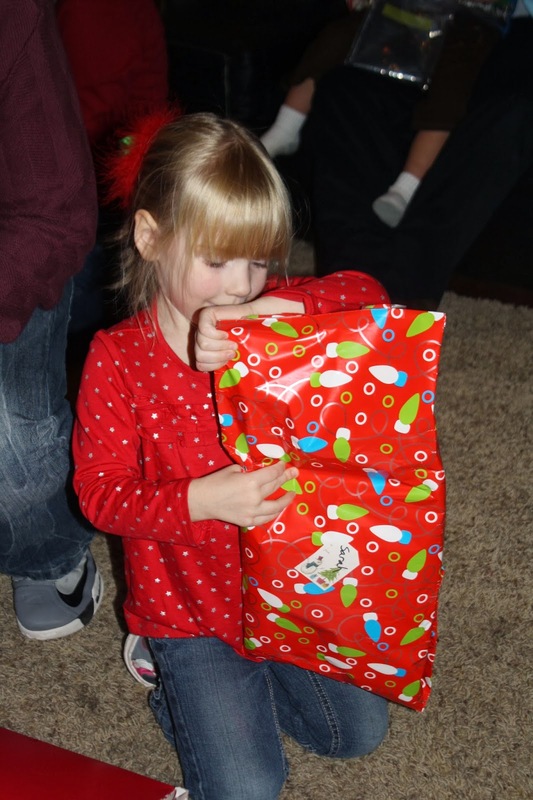 Sarah opening her present from Santa. 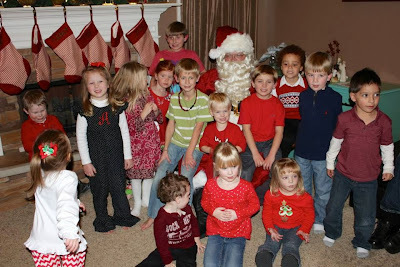 After we cleaned up the blizzard of paper I asked if we could try to take one group shot of all the kids with Santa. 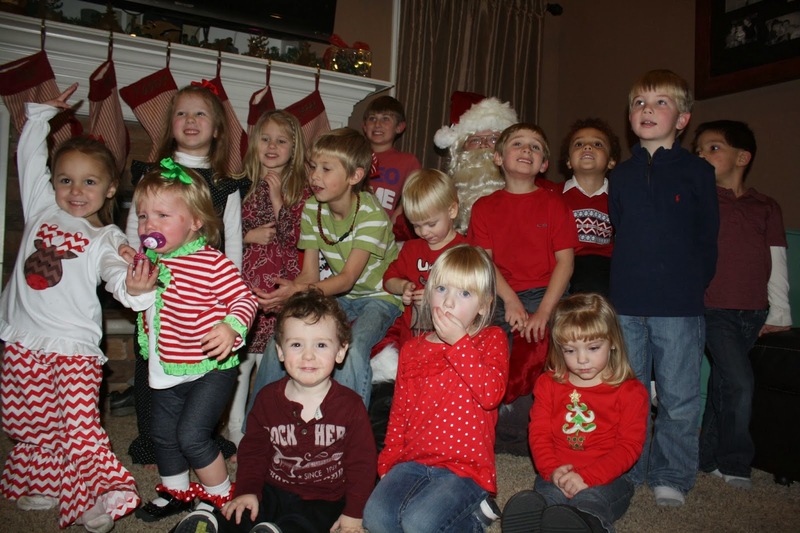 Because you know, group shots of over sugared children always turn out great. 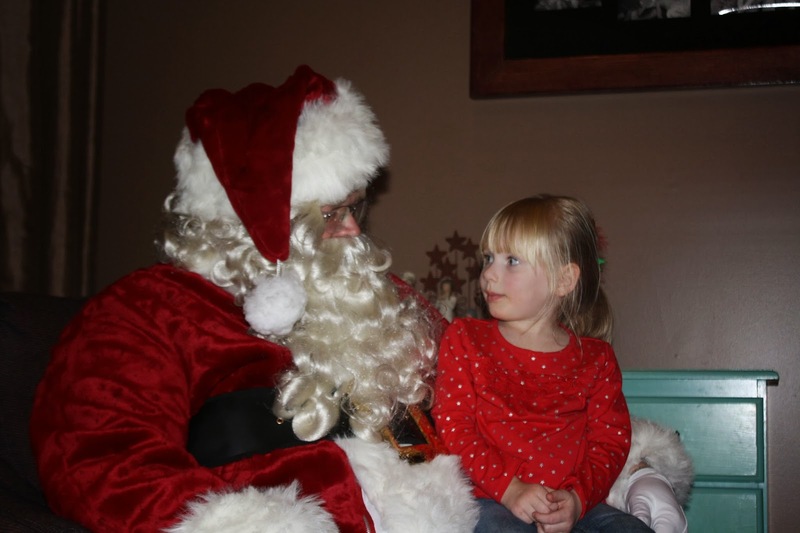 Take one, Ava Claire was having none of Santa. Take two, well, at least Cody was smiling. 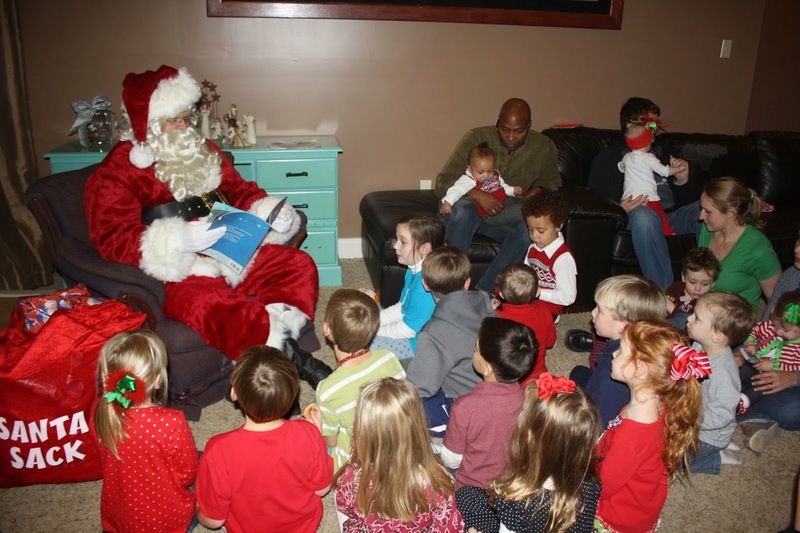 It was a great party and everyone who came said they had a great time. The kids all definitely had a great time. I think we did a good job of making it a kids party that the adults could enjoy too. I wouldn't mind doing it again next year, provided Annie doesn't hate me after this one. Ha! Him laying on his back and inching across the floor like a worm face up. 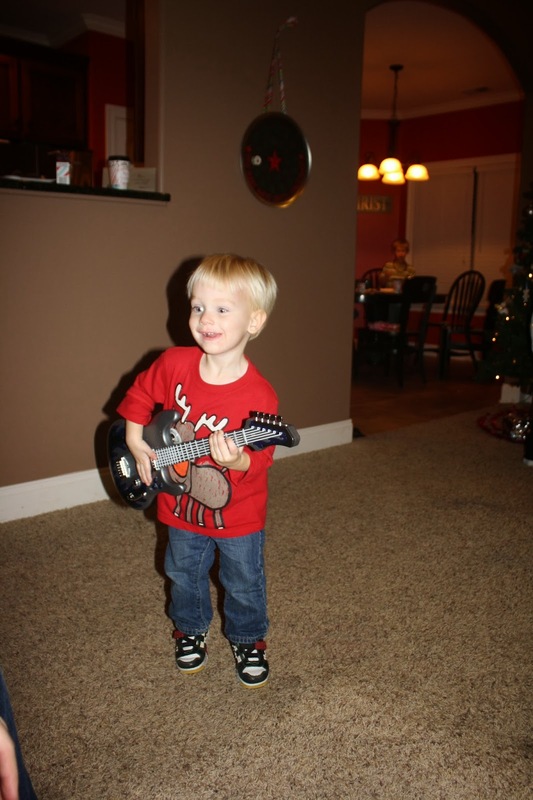 And playing an awesome guitar solo while showcasing his only dance move: hopping up and down. One day down, 11 more to go!